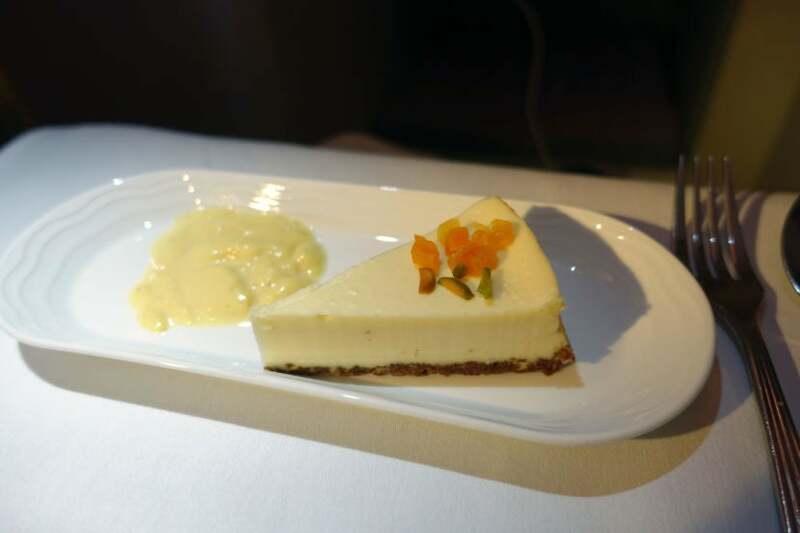 TO THE POINT: After hearing amazing things about the Emirates business-class experience aboard the A380, I had high expectations and am happy to report the carrier did not disappoint. The pros: comfortable seats, super-friendly service and delicious food. The cons: an overcrowded lounge and seats that showed some wear and tear. After an amazing trip last month to Cape Town for my very first PeaceJam conference with TPG, I had to find a way to get back to New York. 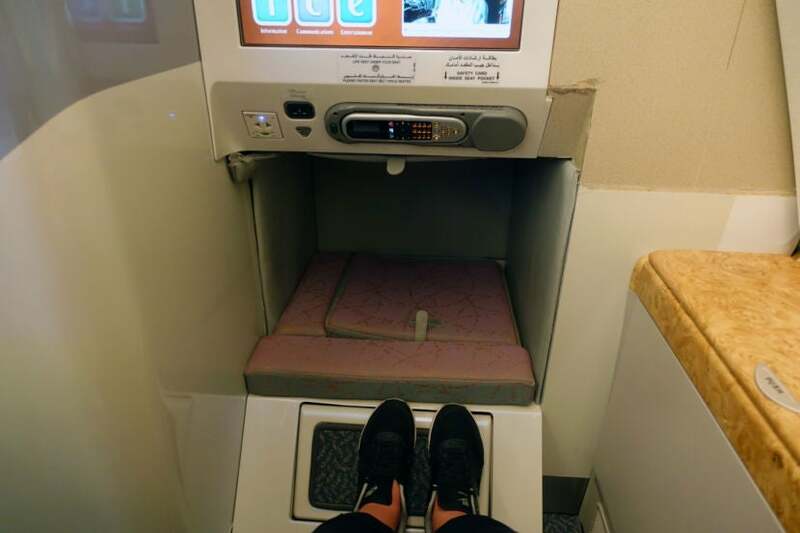 I recently wrote about my choice to fly Emirates from Cape Town to New York via Dubai, and my review of flying on the carrier’s 777-300ER aircraft in business class. 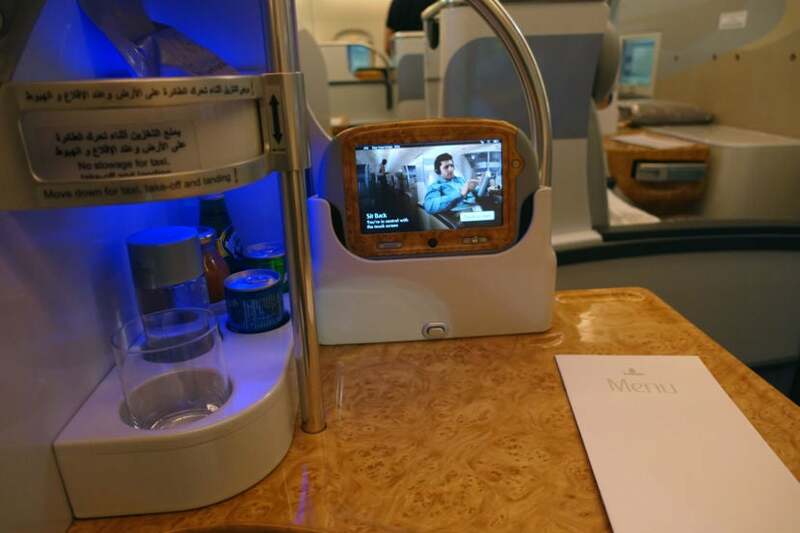 The following review is for the second leg of that trip, from Dubai (DXB) to New York (JFK) in business class aboard the carrier’s A380 aircraft. As I detailed in my review for the first leg of this one-way trip, I booked my flight using Alaska Airlines Mileage Plan miles, since, as an airline partner, you can redeem them for flights with Emirates. This one-way flight from CPT to JFK via DXB cost 120,000 Mileage Plan miles, worth $2,160 based on TPG’s most recent valuations. 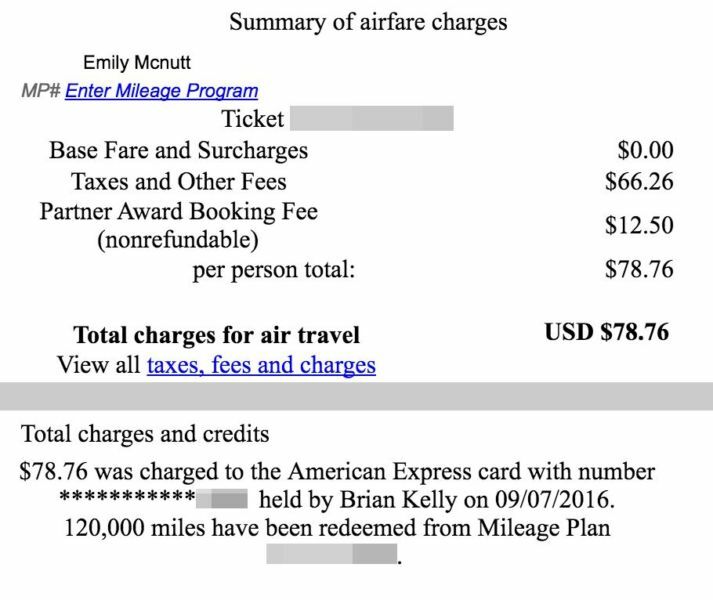 Otherwise, on average, a one-way revenue ticket for this route would have cost about $2,469 at the Flex level. Once I was booked, I checked out the A380’s seat map and figured out where I wanted to sit. I’m a big fan of window seats, so I chose 23K in the bulkhead row. 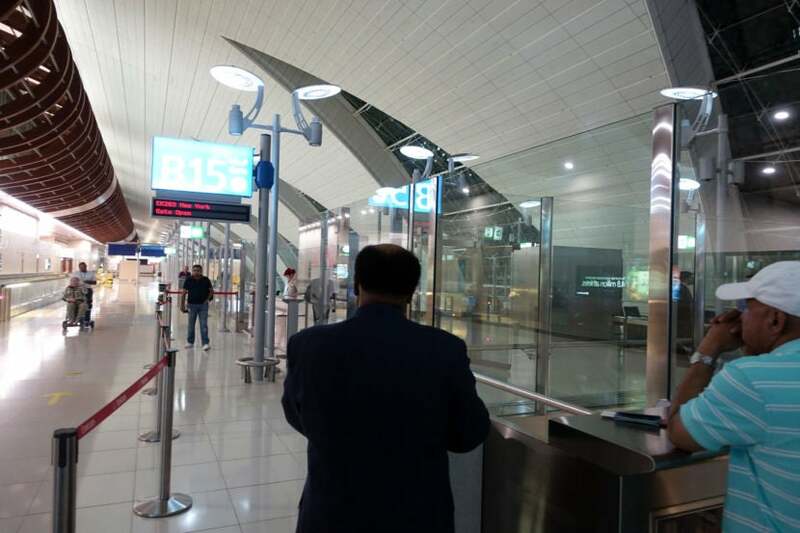 I arrived in Dubai around 1:00am (after a nine-hour flight from Cape Town), where a two-minute ride on a super-luxe bus took us from the plane to the terminal. 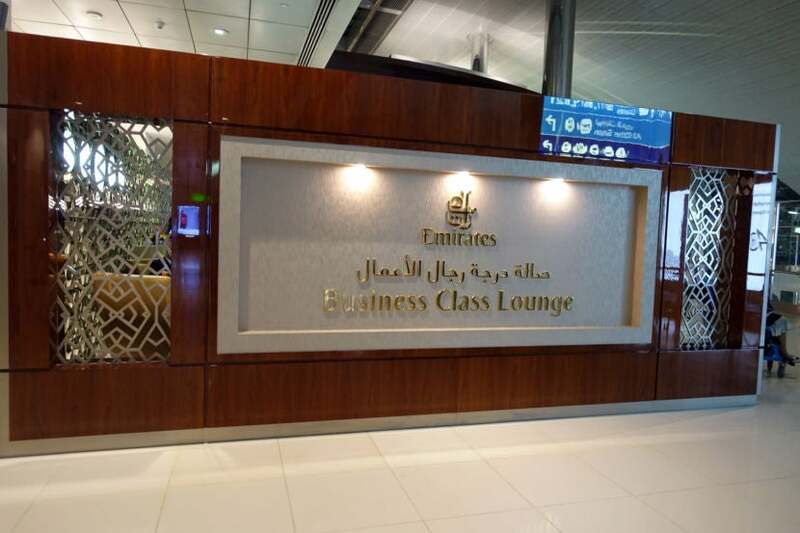 As soon as we got there, I headed straight for the Emirates Business Class Lounge. The lounge itself was difficult to find — although that also might have been because it was 1:00am and I was pretty tired after a long flight. When I was finally able to track down some signs for it, I went up the escalator and made it to the entrance. There was a relatively open entryway with no real doors to go through and plenty of desks with agents there to greet travelers. Upon entering the lounge, I was shocked at how big — and nice — it was. It took me about 15 minutes to walk around the entire lounge just to scope it out — no stopping along the way. Not only was there so much space, it also seemed like the entire lounge was filled with travelers. After I had taken some time to explore a bit, the process of finding an empty seat was pretty tough — even in the wee hours of the morning — so I can only imagine how insanely crowded the space would have been if it were any smaller. 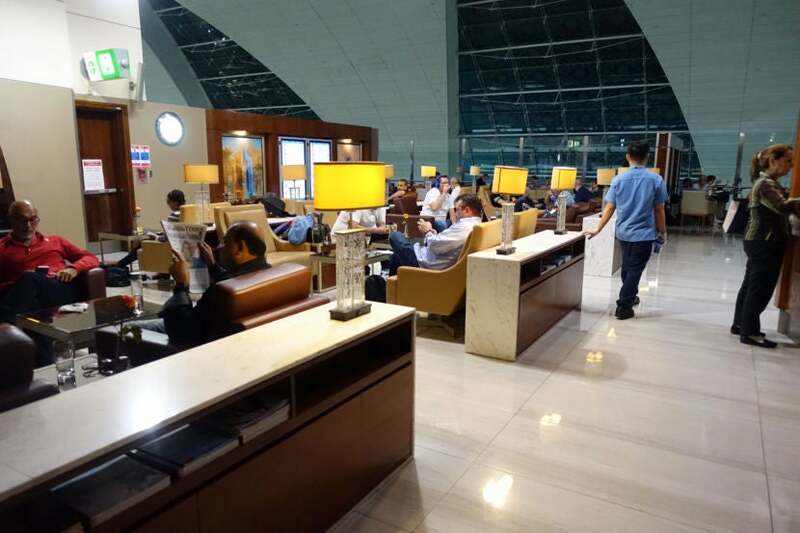 I eventually found my way over to the dining area of the lounge, where there were several two- and four-seat tables. Eventually, I found an empty table and grabbed something light to snack on. I was nowhere near hungry, but still wanted to try something. 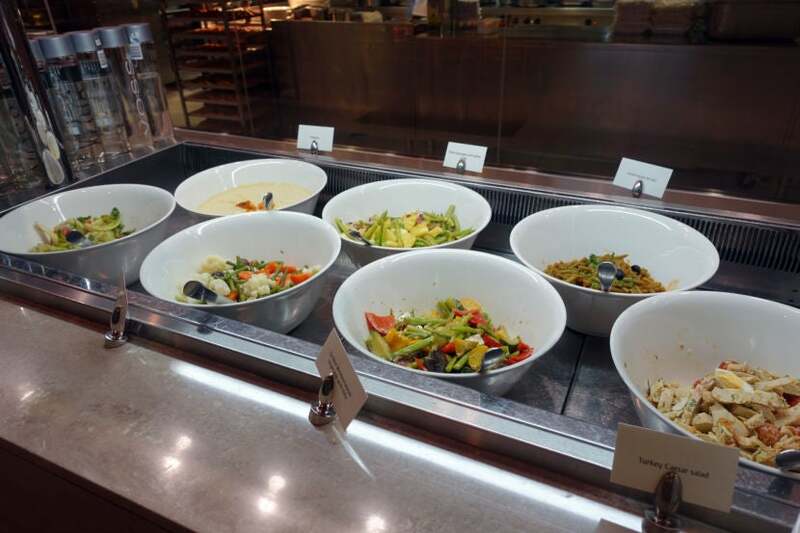 There were a variety of food options ranging from grilled vegetables and fresh asparagus to hummus and turkey caesar salad, among other offerings. 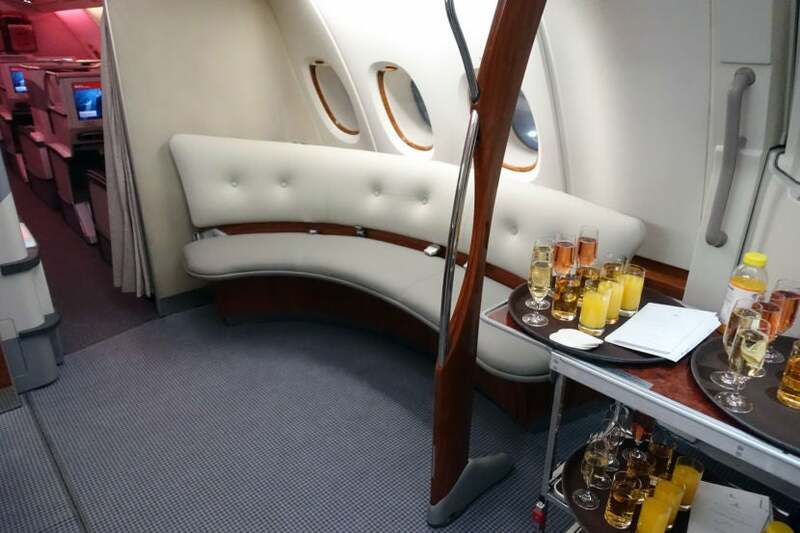 There was also a small selection of wines and Champagne available — an attendant from behind the counter came around to pour drinks whenever someone was waiting for one. 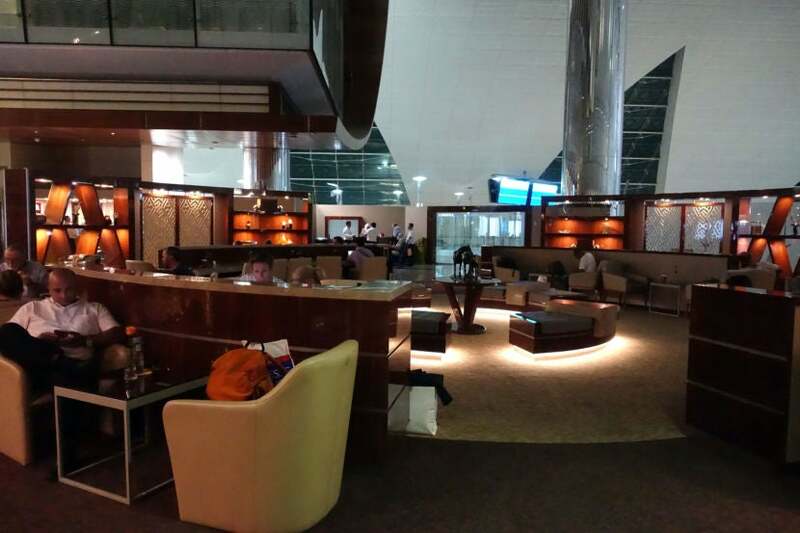 Overall, the Emirates Business Class Lounge was nice, but a bit overwhelming. Between the mass amounts of people, the volume on the inside and the lack of any real private spaces, I would have preferred a quieter spot to await my flight. My business-class boarding gate was located directly in front of the lounge. I left about 10 minutes before the flight was set to begin boarding and found a large line of people there already waiting. It was a bit strange because a sign indicated that the gate was open, yet the gate agents weren’t letting anyone pass. After standing in line for about 10 minutes, the gate agents let those of us standing in line through. An elevator then took groups of business-class passengers down to the jet bridge level where we boarded the aircraft. It was nice not having board through the same bridge as all the economy passengers, and also helped speed up the process of getting everyone aboard this A380. It’s no surprise that the A380 is, in a word, a behemoth. As a business-class passenger, I boarded upstairs and stayed there for the duration of the flight — business- and first-class seats are upstairs, while the economy seats are downstairs. 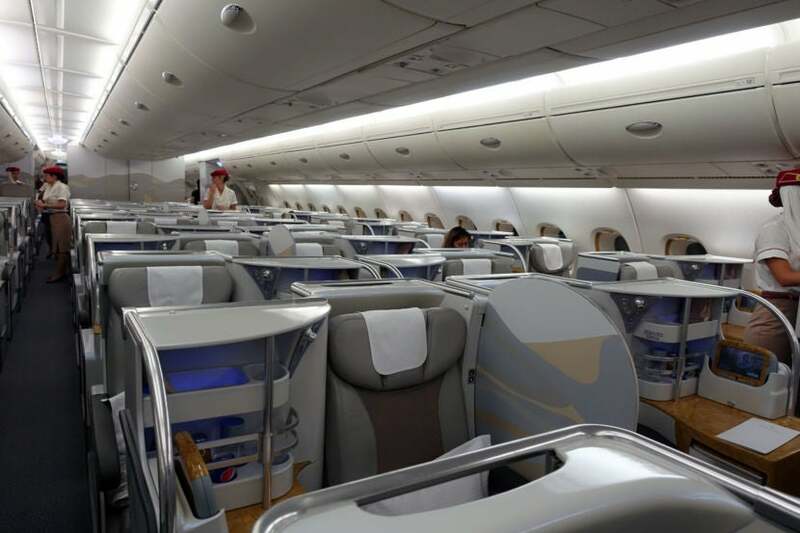 Upstairs, the first-class cabin is comprised of 14 suites arranged in a 1-2-1 configuration. Each seat has 86 inches of pitch and is 23 inches wide. Farther back in the aircraft, the business-class cabin (where I was sitting) is made up of 76 lie-flat seats arranged in a 1-2-1 configuration. Each seat has 48 inches of pitch and is 18.5 inches wide. The economy cabin downstairs is composed of 427 seats arranged in a 3-4-3 configuration. Each of these seats has 32-34 inches of pitch and is 18 inches wide. 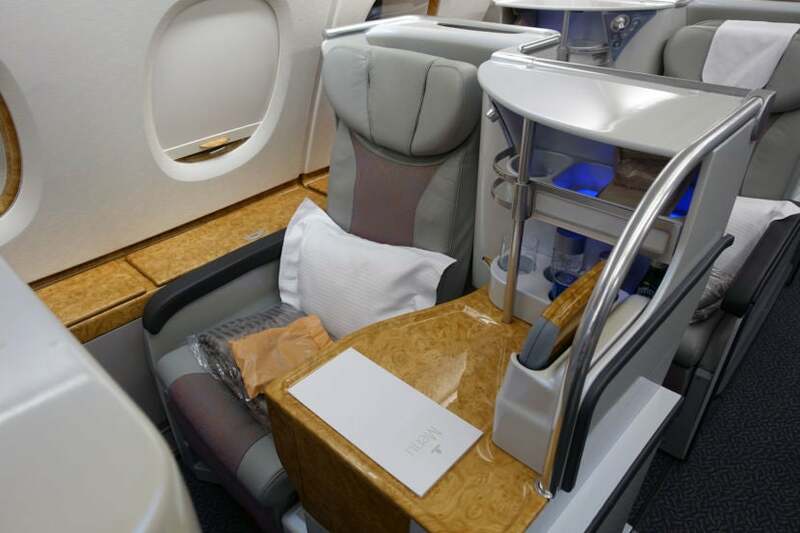 The business-class cabin is split by a barrier. In the front portion, there are 58 seats, whereas in the rear portion, there are just 18. I thought I’d choose a seat in the back portion of the cabin because it’d be quieter, but as it turned out, the cabin was rather empty so it seemed to be quiet everywhere. 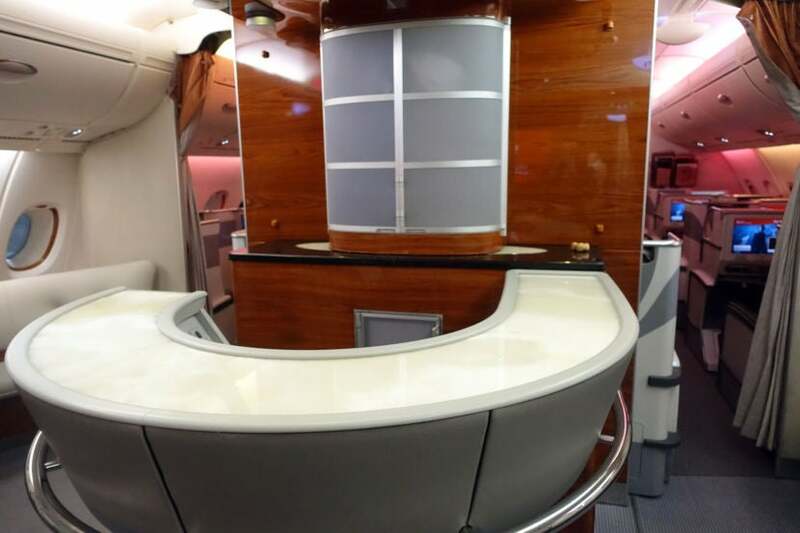 It’s worth noting, though, that the bar and lounge are located in the rear of the aircraft, so that could potentially get noisy on some flights. Each seat is its own little pod. You’ll get massive amounts of personal storage space, including side compartments and a table to put your items on. Each seat also came with a set of headphones, a blanket and a pillow. Looking in the opposite direction, there’s a foot compartment, which is a pretty decent size. Directly above this is the in-flight entertainment screen. For my bulkhead seat, the IFE screen was built into the wall, which was nice, especially considering the one in my bulkhead seat on the 777-300ER from Cape Town to Dubai had to be stowed during taxi, takeoff and landing. For non-bulkhead seats, IFE screens on this aircraft are built into the seat-back in front of you. 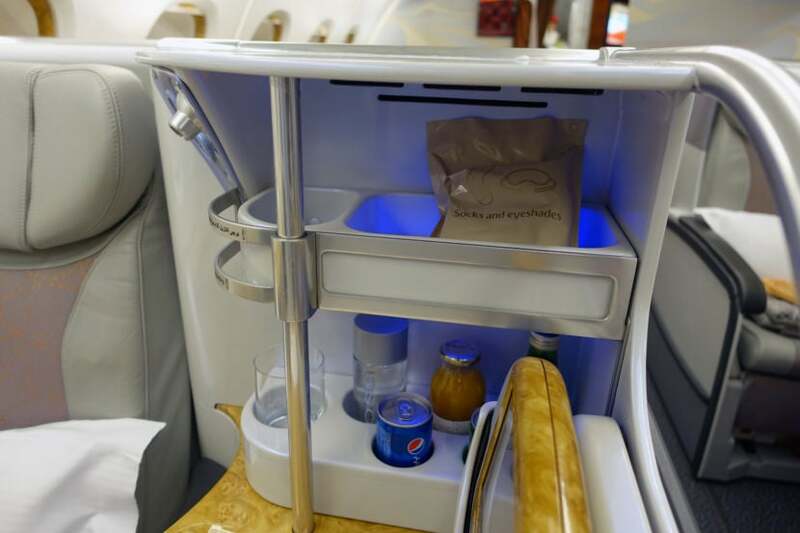 At each seat, there was also a personal mini-bar. The spaces were lit up in blue when I boarded, but there was a light switch so I could turn the blue light off if desired. The two-level mini-bar featured a pair of socks and an eyeshade on the top, as well as a selection of light refreshments on the bottom, including juice, water, sparking water and Pepsi. As I mentioned, there was plenty of leg and foot room in the cubby below the IFE screen. Even while sitting fully upright, I was able to stretch out and remain comfortable, especially with the slanted footrest. I will note that my cubby and seat in general did show a little wear and tear. In the photo below, you can see the worn cubby — at the top right corner and on its interior. Of course, a little wear and tear is expected on a plane, so this wasn’t such a big deal to me. The side table was a particularly welcome feature since I’m so used to not having enough space to place my personal belongings — even in premium classes — so being able to keep track of my things here was a plus. On the table closest to the aisle was the handheld touchscreen remote control. You may note that on my previous flight in business class aboard Emirates’ 777-300ER, the same touchscreen remote was a bit laggy and not the most responsive. The remote on this flight, however, worked swimmingly — even the massage function was better! Above my left shoulder (the side closest to the aisle), was a personal light, a switch for the mini-bar blue light and some additional buttons for adjusting the angle of the seat. These were nice to have so you weren’t always required to use the touchscreen remote to turn on the overhead light or recline your seat. I mentioned earlier that there was plenty of personal storage space, and one of the best examples of that was the two large, rather deep bins, located against the side of the cabin and windows. While the bins were big, I found the mechanism needed to open them a major design flaw — they could be opened and closed by pressing down on them, so if I rested my arm in the position that felt most comfortable, the bin would suddenly open whenever I moved. Ideally, these spacious bins could feature a more secure latch instead. The cabin itself was very spacious, with seats that were very comfortable and offered plenty of room to stretch out — I would recommend getting one with a table that’s located closest to the aisle so you have more room between you and the other people walking by. 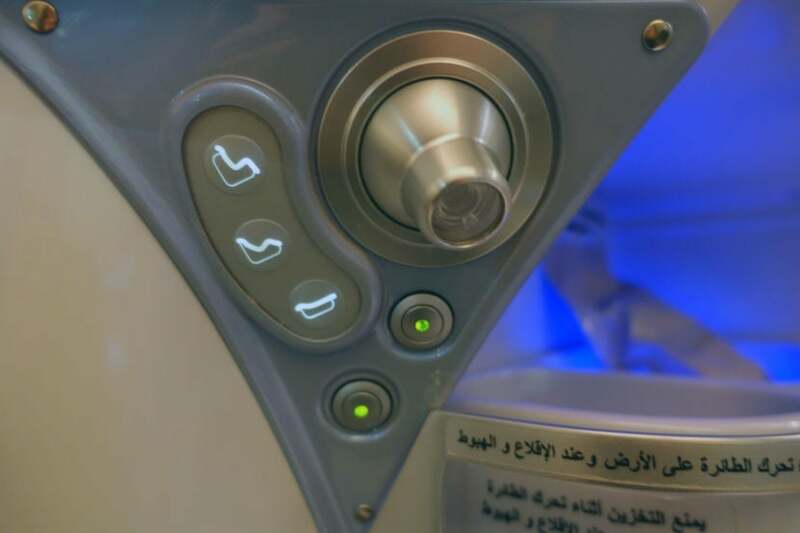 For seats in the middle of the cabin, there was a privacy screen, which could be left open or closed depending on your preference. If you’re traveling with someone, I’d recommend grabbing a pair of seats that don’t have the table between you. 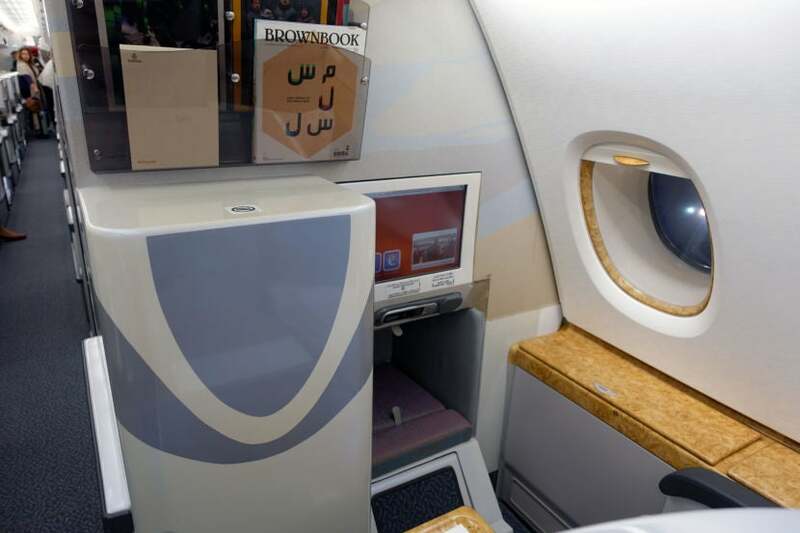 The open and airy feel of the cabin helped to make the experience more personalized as well. 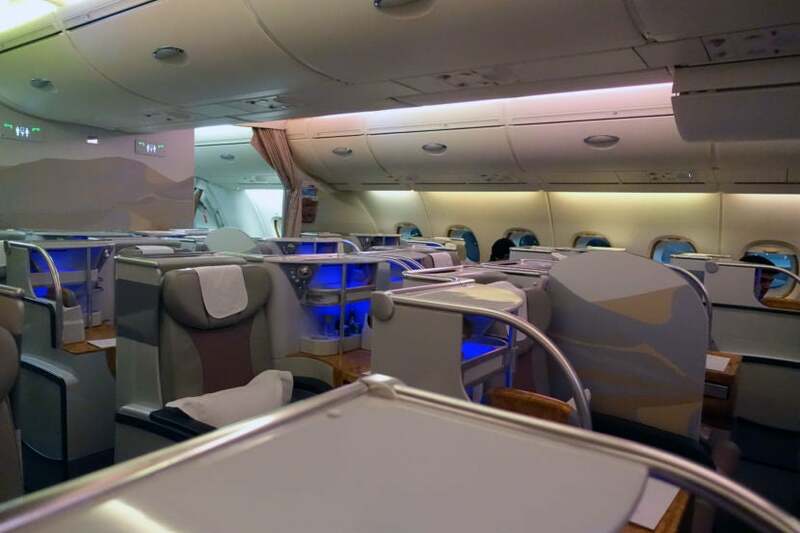 Although on this flight the business-class cabin was rather empty, I’d imagine that even if it were full, the amount of people here wouldn’t be too overwhelming. 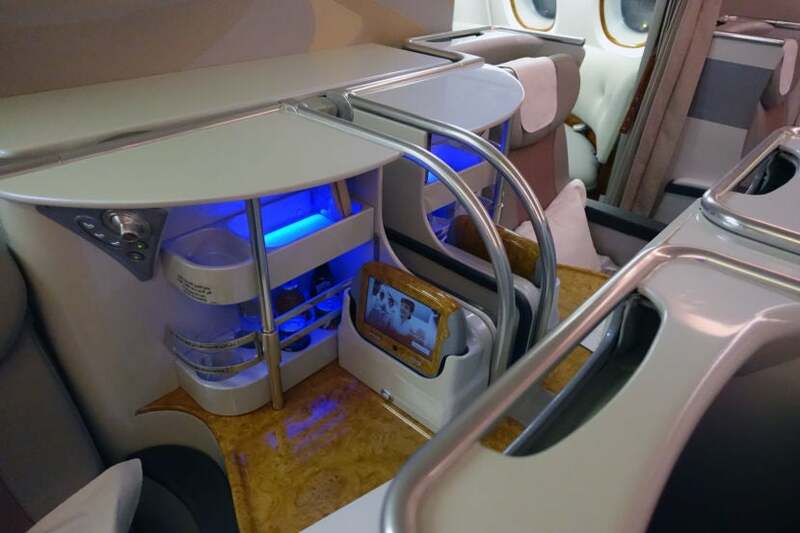 The business-class cabin on the Emirates A380 was unlike anything I’d ever experienced in the sky — the overall luxe nature of the cabin and seats helped make the journey a vacation in itself. 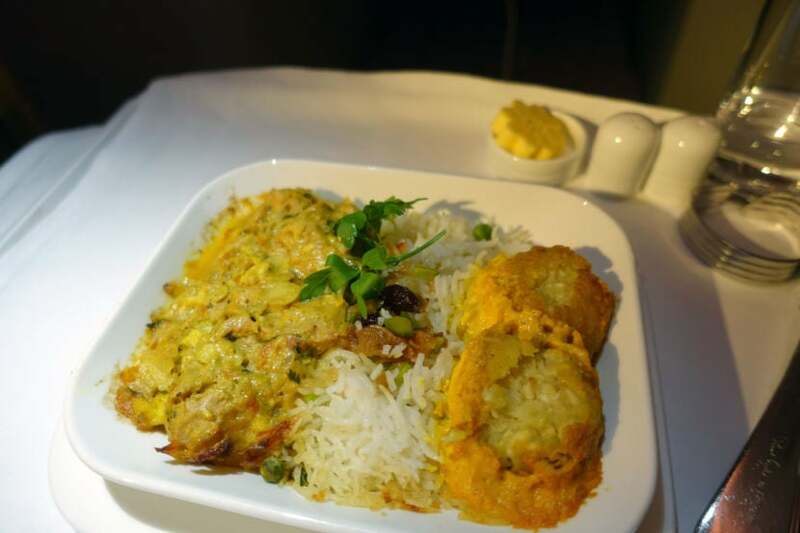 One of the nicest parts about my first Emirates flight was the meal service — the service was quick, efficient and the food was delicious. Needless to say, I was excited to try out the options on this nearly 14-hour flight. While I was still getting settled into my seat, the cabin crew came around with a pre-departure drink (I chose to have rosé Champagne). 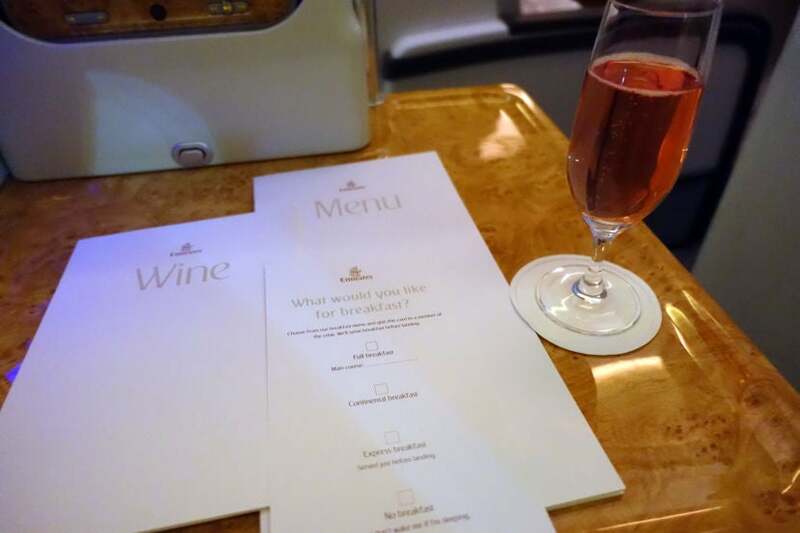 FAs also handed out menus for the flight — a wine list, food menu and a breakfast option — which served as a nifty little way of letting them know if you wanted breakfast service (or not) without having to wake you up to find out. 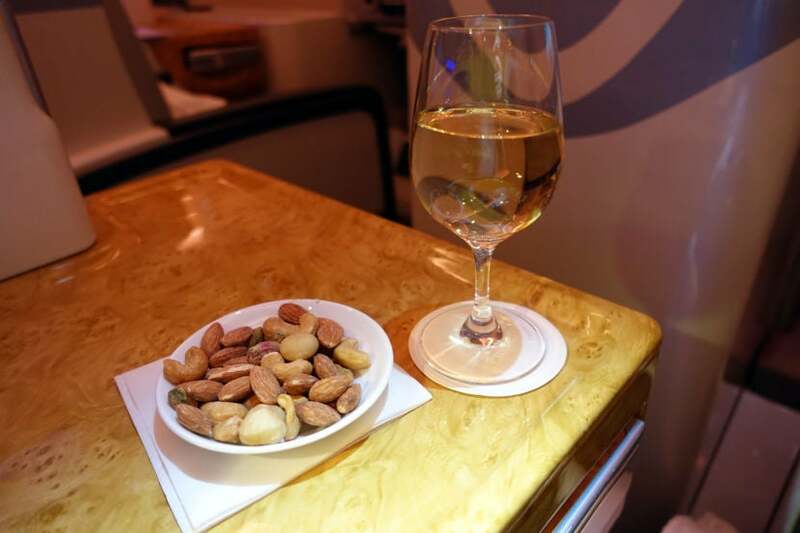 I started the meal service with some warm nuts and a glass of white wine, a great way to set the tone for the meal service to come. To start, I selected roasted tomato soup with thyme and balsamic shallots. The tomato soup, which was served with a choice of bread, was warm, perfectly seasoned and really hit the spot. You may notice in the picture below that my tray table looks a little small, and that’s because it was. The second part of the table was broken and slanted downward so I had to keep the meal balanced on only half the tray. It wasn’t a big deal, but it would have been nice to have had some more room. Other appetizer options included a traditional Arabic mezze with mujaddara, muhammara, stuffed vine leaves and hummus or herb-coated tuna loin on a green bean salad with edamame and roasted red peppers. For my main course, I chose the mughlai chicken, which was serviced in a creamy gravy sauce with basmati rice and green peas with paneer dumplings in saffron sauce. As bland as my meal may look in the photo, it was full of great spices, which made it very flavorful. The paneer dumplings were especially delicious. Other choices for the main course included roasted beef short ribs served off the bone with barbecue sauce, fingerling potatoes and steamed green beans or prawns with garlic and coriander served with herb butter sauce, steamed rice and seasonal vegetables. To finish off the meal service, I had a slice of fig cheesecake with dried apricots and cinnamon sauce. By this point, I was incredibly full, but had to save enough room for at least a few bites of the fig cheesecake — it was amazing, but the cinnamon sauce took it to a whole other level. Additional dessert options included chocolate truffle cake with cherry compote, seasonal fruit and a cheese board with crackers and other tasty accompaniments. I also rounded off meal service with a cup of green tea served with biscotti and a piece of chocolate. 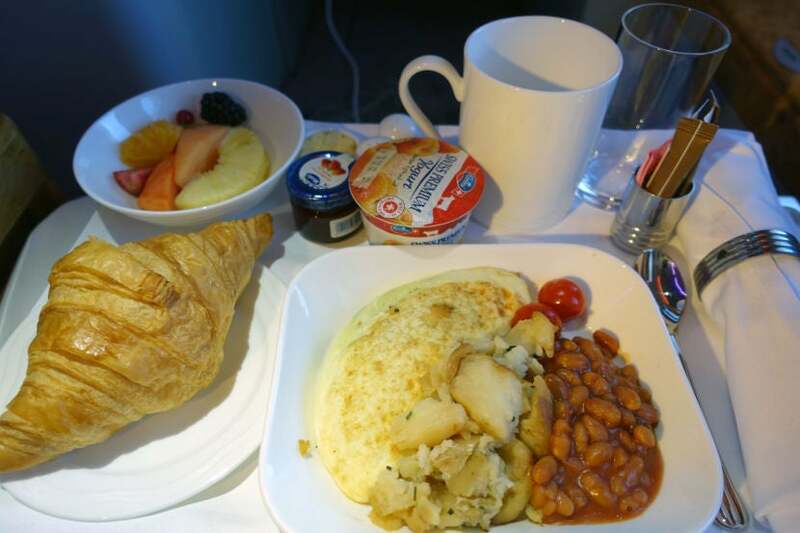 A few hours before landing, a flight attendant came around and woke me up with the breakfast I’d ordered at the beginning of the flight. I chose the spinach and feta egg white omelette served with baked beans, roasted cherry tomatoes and crushed potatoes with chives. Other breakfast options included Eggs Benedict, veal rashers on English muffins served with hollandaise sauce and roasted cherry tomatoes, as well as aloo bhurji with spiced scrambled eggs and potatoes served with aloo tikki, minced mutton curry with lentils or a continental cold plate featuring sliced grilled chicken, bresaola, red Leicester and gruyere, served with tomato and cucumber. 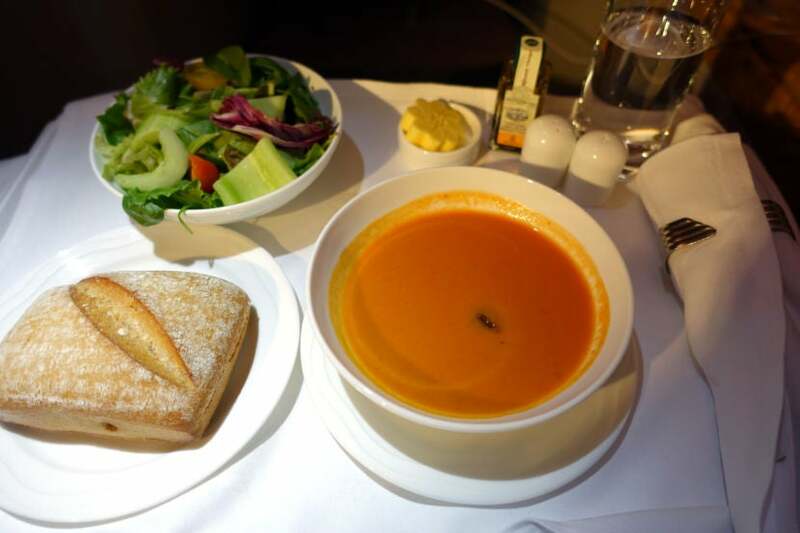 The meal service on this flight was above and beyond anything else I’ve had at 35,000 feet in the air — everything from the efficiency of the service to being able to choose your breakfast before falling asleep was simply on point. 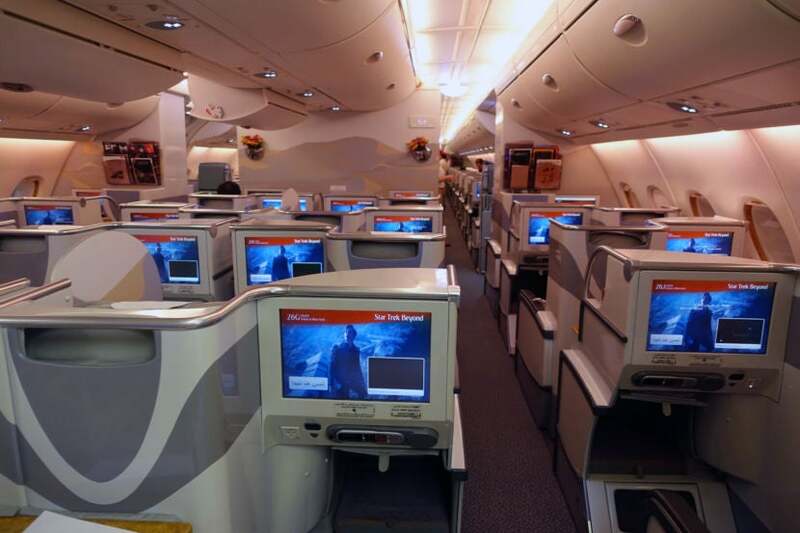 Besides the seat and meal options, one of the other aspects in which Emirates excels is with its in-flight entertainment options, amenities and service. 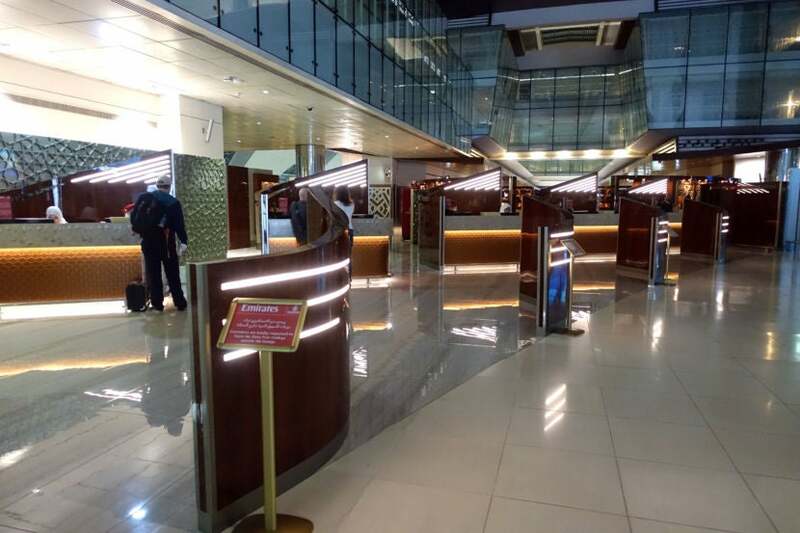 Let’s start with the business-class lounge upstairs, which features a full bar as well as additional seating, making it a great place to get up, stretch your legs and spend some time socializing with the other passengers and crew. 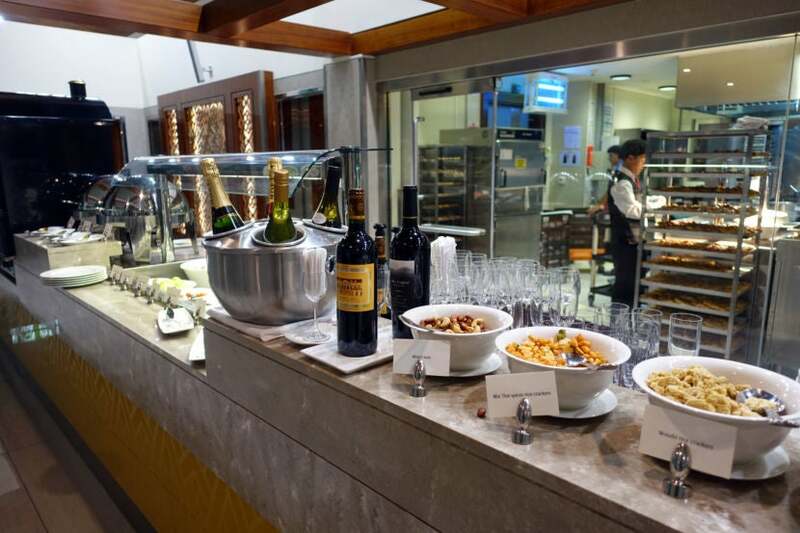 At the back of the lounge, there’s a selection of finger foods and desserts. 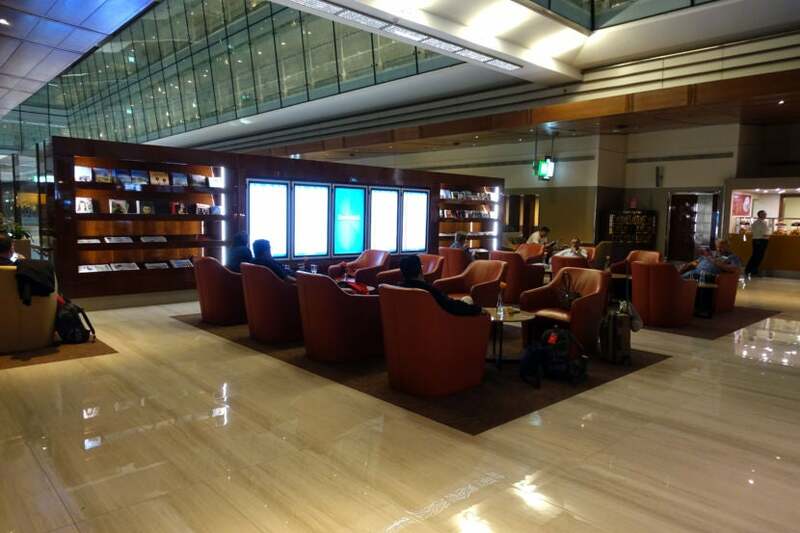 Because I was so exhausted, I slept for the majority of this flight, but when I did wake up, I went to check out the lounge and was impressed with the upkeep and overall atmosphere. 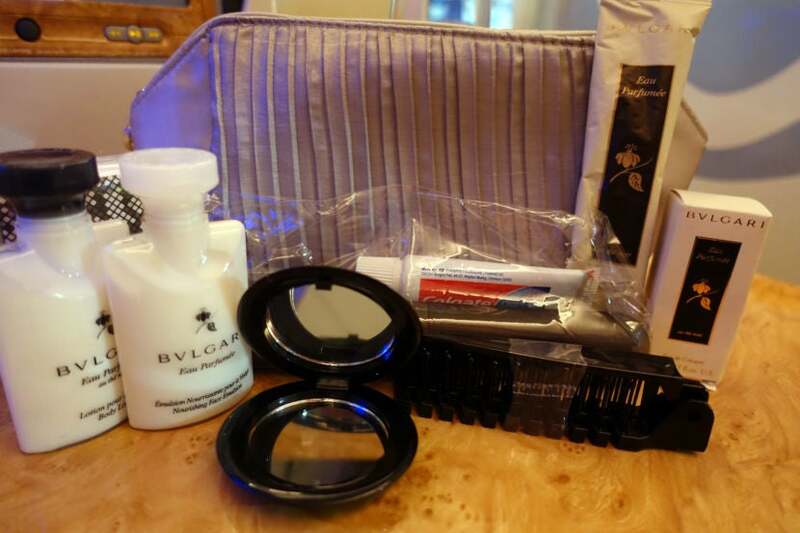 There was also a nice amenity kit, with the same contents as the one on my last flight — a satin kit full of Bvlgari products, a dental kit, hairbrush and mirror, which were nice and left me feeling refreshed when I arrived in New York. The in-flight entertainment system contained the same content as the one on the 777-300ER I’d been on just hours before — as I mentioned earlier, the handheld touchscreen remote on this flight worked better, which was a welcome difference. Because I spent the majority of this flight asleep in the lie-flat bed, my screen remained off (or on the flight tracker) most of the time. The service on board this flight was just as good as it was on the last flight — and among the best I’ve ever experienced in the air. Again, when a flight attendant saw me taking a lot of pictures, she asked if I wanted a photo of me in my seat. I’m a firm believer that the service on board can make or break an experience, and the friendly, welcoming crew here completely made this experience a memorable one. 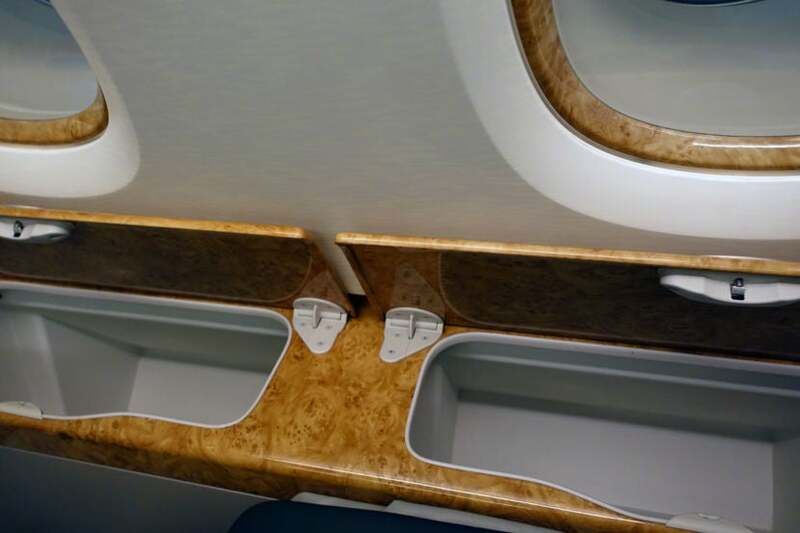 My experience with Emirates’ A380 business-class product was all that it was cracked up to be. I’d seen the pictures and the videos of how amazing it could be flying with this carrier, and I’m happy to report I wasn’t disappointed. From the seats to the service, the meal and the lounge at the rear of the aircraft, this experience was like none other I’ve had in the sky. 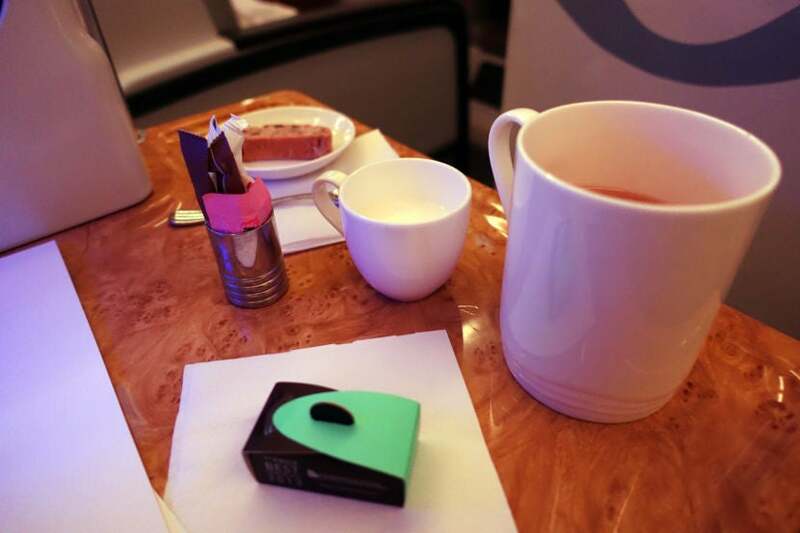 I’d definitely consider flying with Emirates carrier again — especially in business class. 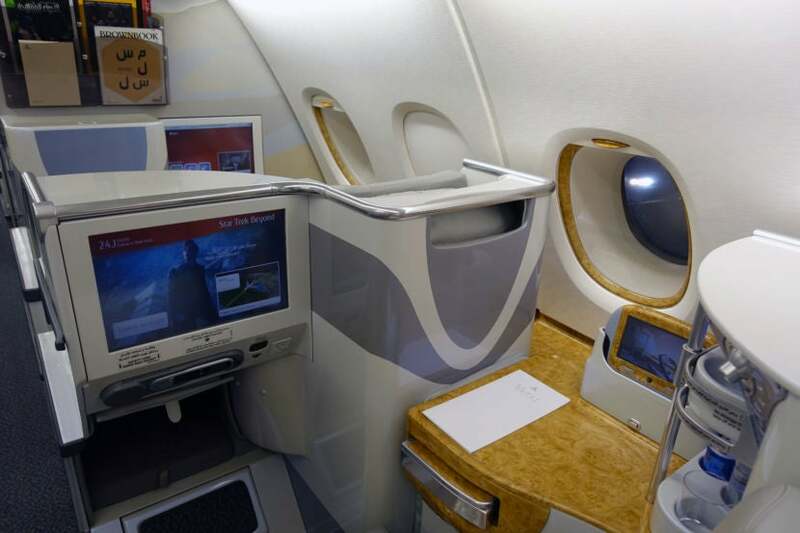 Have you flown in business class on Emirates’ A380? Share your experience, below.